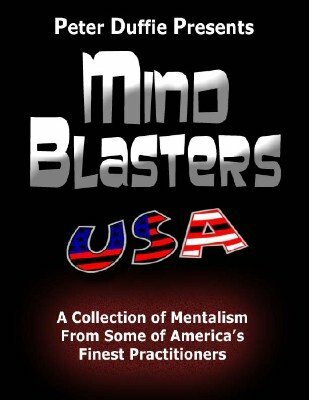 A new mind-blowing collection of more than 80 mentalism routines from some of America's finest practitioners. 1st edition 2012, 358 pages, with photos and illustrations. As a Welshman resident in Dubai, who has a minor contribution included as an addendum to one of the routines, I may have a somewhat unusual perspective as a reviewer. At 358 pages and with 33 contributors and numerous photographs this has to be worth your consideration. The material covers a wide spectrum of presentations, effects, and props. There is a lot of crediting—in many cases to little known sources—and some may find it frustrating to track these down, but at least you will know what you are trying to find. Inevitably a number of the effects are offshoots or variations of earlier work by other authors, and in some cases the full working details are therefore not revealed. In most cases, if you are interested in such materials you will already have the necessary knowledge. Although after a quick read I was able to identify several effects I know I will use, what impressed me much more was how much practical experience and know-how was being shared. One advantage of ebooks is there are no printing costs, so editors do not have to prune quite so hard. This allows a more discursive approach with more emphasis on presentational details, or patter and how effects originated or pointers to other direction to follow. Mentalists tend to be more patter and procedure-heavy because they are generally telling a story rather than demonstrating an effect, but that does not mean the presentations are dull or dry — there is plenty of humour here. Some write ups may seem over long, others may seem unfinished. Professionals know there is only one best way to do the effect, and through numerous performances, have polished off all the rough edges and doubts. Creators and inventors may perform less and be reluctant to stop the creative process and spin off endless possible variations. This book includes examples of both, and overall is the better for it. There is just so much useful background information that you may use for many different effects than those presented. You will find creative uses of objects like bottles and caps, predictions, mind reading, spectator control, a magic cross instead of a magic square, how to create ghostly voices, spirit messages, tricks with droodles, psychometry, astrology, mobile phones, recorders, haunted blocks, sugar packets, Zener cards, Multi-sensory, psychokinesis, coin bending, divination, cold reading, bank nite, balloons, book tests, matches, money and even a smattering of card tricks. So many useful patter lines and tips on audience management; so many different ways of creating emotional hooks that even in the unlikely event you find no tricks of interest you will still value the concepts, ideas, advice and information. For me, on an initial skim through, Chuck Hickok’s two short pieces were enough reason to know this book was worth buying and I was not even halfway through.